The overall number of orders is similar to the average ordering pace over the past 10 years, during which an average of roughly 25 production and storage floaters were ordered annually. But the ordering pace by type unit is quite different. FPSO orders in 2014 were 25% below the 13.5 average ordering pace over the past ten years – and in 2014 no orders were placed for Spars, TLPs or Production Semis, which between 2004 and 2013 averaged 3.5 orders per year. Offsetting these declines were gains in orders for FLNGs and FSRUs. Between 2004 and 2013 the ordering pace for LNG liquefaction and regasification units averaged three units per year. The number of ordered placed in 2014 for these type units was more than three times this average. Orders placed during the year are shown below. The unit EPC contractor/lessor is in parentheses. The huge drop in oil/gas prices and ongoing financial investigation in Petrobras have combined to create a perfect storm in the deepwater sector. Oil company capital budgets are being trimmed to offset the downturn in revenue and investment decisions are being deferred until oil pricing rebounds – and the investigation involving Petrobras is impacting its ability to order new production floaters. This perfect storm is clearly causing anxiety throughout the deepwater supply chain. However, in our view, it is not a repeat of 2008/09, when the global financial collapse caused oil prices to crash and floater orders to dry up for 12 months. Unlike six year ago, the deepwater market will not come to a standstill in 2015. Lower oil prices obviously decrease near term cash flow and impact the ability to fund capital spending. But the price at which oil can be sold when the project comes on line – not the current price – is what determines projected return on investment. Deepwater projects take two to four years to come on line following the investment decision. The expected price post start-up of the facility is what really counts. No one expects oil and gas prices to remain at the level they have dropped to over the past few months. The futures market, for example, is pricing crude three years out at $20 more that the current spot price. The longer term outlook is what ENI took into account when in late January it sanctioned start of the $6 billion project to develop the Sankofa oil/gas field offshore Ghana. This produced the first FPSO order in 2015. Demand and supply fundamentals have not really changed. What we have is a short term out-of-balance in supply and demand. This will self-correct. The question is when (not whether) prices will rebound to a higher level. As for Petrobras, the company will sooner or later resolve its financial and contracting issues. Petrobras is a powerful company with 14 billion barrels of proved oil reserves. It is a technology leader in the deepwater sector. The issues that caused the implosion will be resolved and the company will get back to focusing on its business plan to grow oil production. For starters, Petrobras will likely soon lift the constraints imposed on who can bid for contracts. Prohibiting virtually all of its major local suppliers (plus SBM) from bidding on new contracts is hurting Petrobras as much as (maybe more than) the targeted companies. Common sense dictates it’s time to get on with normalizing business. More than a dozen floating production projects in the advance planning stage have reasonable likelihood to move to EPC contracting for production facilities within this year. These projects are likely to produce orders for three to five FPSOs in Brazil, two FPSOs in Africa, an FLNG in Africa, a production semi in the GOM and several FSOs in SE Asia – all within 2015. 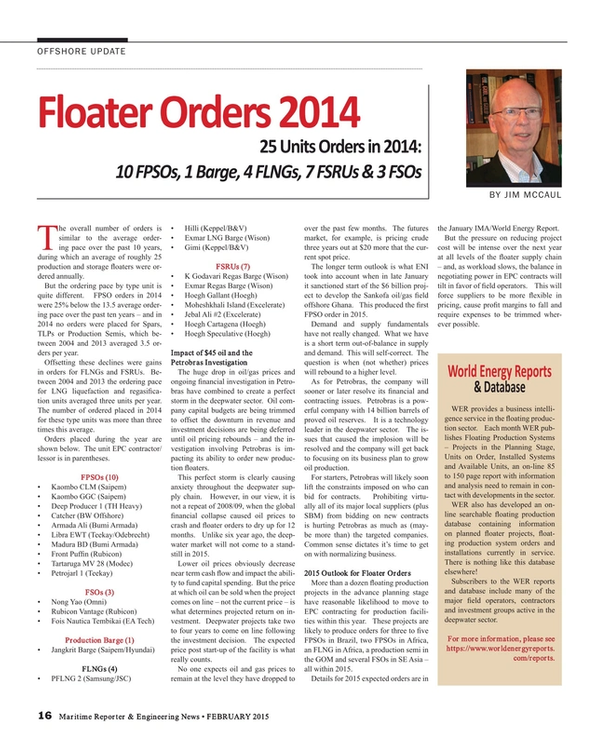 Details for 2015 expected orders are in the January IMA/World Energy Report. But the pressure on reducing project cost will be intense over the next year at all levels of the floater supply chain – and, as workload slows, the balance in negotiating power in EPC contracts will tilt in favor of field operators. This will force suppliers to be more flexible in pricing, cause profit margins to fall and require expenses to be trimmed wherever possible. WER provides a business intelligence service in the floating production sector. Each month WER publishes Floating Production Systems – Projects in the Planning Stage, Units on Order, Installed Systems and Available Units, an on-line 85 to 150 page report with information and analysis need to remain in contact with developments in the sector. WER also has developed an on-line searchable floating production database containing information on planned floater projects, floating production system orders and installations currently in service. There is nothing like this database elsewhere! Subscribers to the WER reports and database include many of the major field operators, contractors and investment groups active in the deepwater sector. For more information, please see https://www.worldenergyreports.com/reports.